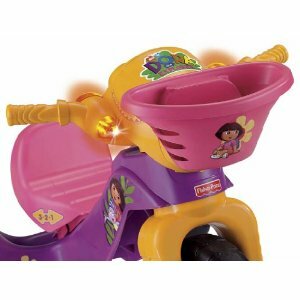 Dimensions: 29" x 22,5" x 20"
Made of plastic Dora the Explorer has several advantages and also disadvantages – firstly it`s cheap, durable and lightweight. 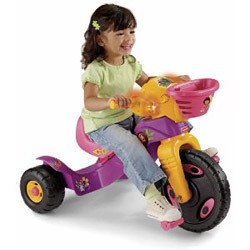 On the other hand it`s not as sturdy as more expensive metal trikes of course. It also uses plastic wheels which are known to be a little noisy when riding and lack traction (also can get scratched when riding outdoors). But all in all it provides a nice ride. The body is also nicely colored and some colorful graphics are present as well. The main plus of this vehicle is probably the sound and lights system (powered by 3 AA batteries) – there are 8 buttons on the handlebar (see the picture on the bottom of this page) which can be used to turn on/off flashing blinkers and also various sounds like Dora`s voice (saying phrases in English or Spanish), music or some fun sounds. Very nice feature we must say, kids really enjoy that. 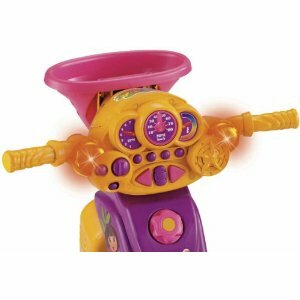 And the music is really nice, not some kind of disturbing one like we see on a lot of electronic toys. There are also some additional and useful features we should mention. The first is an adjustable seat – you have 3 positions where to place it so it can grow with your child. And the second one is a basket on the front side of the handlebars – it`s not big but enough for some little stuff. And what`s the recommended age of this tricycle? 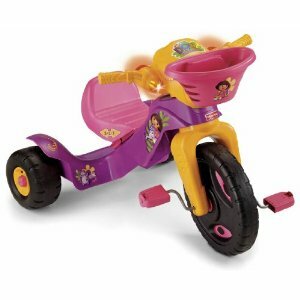 The manufacturer says 2-6 years – nevertheless most kids won`t probably reach the pedals at the age of 2. However parents say that their 2year (and even younger) kids love it anyway – play with sounds, push the trike around or push themselves by their feet. This entry was posted on Thursday, June 16th, 2011 at 9:26 am	and is filed under Fisher-Price, Kids.